What explains state policy decisions toward ethnic groups? In The Politics of Nation-Building, Harris Mylonas argues that variations in nation-building policies are the “result of the interaction between host states and external powers rather than non-core groups and host states” (5). This novel approach not only pioneers a new theory in this well-trodden field of ethnopolitics, but also, at a broader level, integrates international relations with comparative politics. The model offered by Mylonas offers political scientists a wealth of testable hypotheses and will likely become a staple of any literature review on approaches to understanding ethnopolitics. These three actors are caught up in a political dance. Mylonas traces the logic as follows: “this external involvement, whether clandestine, covert, or overt, drives not only the mobilization and politicization of the non-core group’s identity, but also the host state’s perception of the non-core group and the state’s nation-building policies toward the group. Hence, the foreign policy goals of the host state and its interstate relations with external powers drive a host state’s choice of nation-building policies toward non-core groups” (5). An external power may either be an ally or an enemy and a host state’s foreign policy may be either revisionist or status quo. The explanatory model in The Politics of Nation-Building is “a reversed-neoclassical realism, where foreign policy goals interact with the nature of interstate relations with the external patrons of non-core groups to condition nation-building policies” as opposed to standard neoclassical realism “where domestic incentives affect a state’s foreign policy behavior” (6). Mylonas evidences an admirable precision in the way he defines his variables and parameters. He limits his argument to countries that 1) have a regime representing a core group with clear boundaries (“national type”), 2) have non-assimilated segments of the population and there is no caste system, and 3) the state directly rules the population. In examining the empirical evidence regarding nation-building in post-World War I Balkans, Mylonas convincingly shows the strength of his predictive model. On the other hand, group size and the presence of a nation, differences in language and religion, and whether the non-core group once held dominance, all fail to accurately predict the shift in nation-building policies. There are, however, outliers to his test. Mylonas’s argument incorrectly predicted 19 percent of the Balkan cases. To address these outliers, Mylonas adds important considerations that influence the analysis. First, the role of the time horizon of the case study. Independent variables may change at different paces for different nations in a cross-national analysis such as the one Mylonas conducts in the Balkans. Second, the complicating presence of mixed policies where some members of the non-core group may be treated differently than the rest, which makes it difficult to classify the policy as a whole accommodationist, assimilationist, or exclusionary. A threshold percentage must be instituted, but this is up for methodological debate. Third, some policies are merely transitional, whereas the terminal goal is different. International standards of minority rights change depending on the era. Regimes may choose to accommodate for the time being, but intend to eventually assimilate the non-core group in favorable conditions. Fourth, the asymmetrical nature of alliances may give host states leeway in its policy decisions. A host state may choose to assimilate a non-group even when it is supported by an external ally if the ally is not very strong or has signalled a policy of non-interference in how the host state chooses to treat the non-core group. Mylonas takes his analysis to an even deeper level when he considers subnational variation in nation-building policies; that is, what causes variation in policies toward different non-core groups in the same host state. He uses Greek nation-building in western Macedonia between 1916 and 1920 as his case study. This is an ideal test case since in Greek Macedonia there was a large number of non-core groups (“Greek-leaning” Slavs, “Greek-leaning” Vlachs, Sarakatsans, Valaades, Albanians, Koniareoi, “Romanian-leaning” Vlachs, “Bulgarian-leaning” Slavs, etc. ), with overlapping religious and linguistic cleavages. From 1916 to 1920, Greece shifted from a revisionist foreign policy to supporting the status quo in relations with Macedonia. Mylonas examines each non-core group and the nation-building policies directed toward them, then compares the explanatory power of his argument as opposed to those of cultural distance, status reversal, and homeland. Mylonas demonstrates that ruling political elites made policy decisions based primarily on geopolitical and security considerations. These decisions, moreover, matched his four predictive configurations. Impressively, Mylonas takes it one step further. After looking a classical post-World War I Balkans case, then examining subnational variations, he cements his argument with temporal variations. For this final tactical maneuver, Mylonas focuses on Serbian nation-building toward Albanians from 1878 to 1941. The mainstream account of Serb-Albanian relations during this time is a consistent policy of repression, without any fluctuations, but Mylonas demonstrates that there was a shift from exclusion of Albanians (1878-1915) to assimilation (1918-1923), then a brief period of accommodation (c. 1924) and back again to assimilation (1925-1941). Religious beliefs were secondary–the Slav-speaking Muslim and Albanian-speaking Muslims were subject to the same policies. Ethnicity, also, was secondary–both Albanian Muslim-dominated Kosovo and Slav-dominated Orthodox Christian Vardar Macedonia were subject to colonization. The best explanation is that “the choice of nation-building policies…was based on an interaction of the perceived danger of secessionist claims by the externally backed Kosovo Albanian elites and state relations between Albania and Serbia” (169). The final application of Mylonas’s theory is to the rest of the world, beyond the Balkans. Naturally he cannot undertake an in-depth analysis of each country, nor is the appropriate data for such an analysis available for every region or country. With the same methodical habit demonstrated above, he first deals with the same region, but different periods. 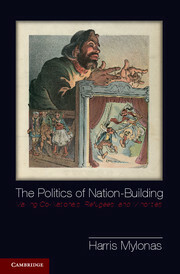 Mylonas covers nation-building in the Balkans both in the nineteenth century and after World War II. Then he addresses different regions altogether, examining China’s nation-building pursuits in Tibet and Xinjiang during the Cold War, and lastly Estonian nation-building after the Cold War. Mylonas is not shy when it comes to debunking the claims of other nation-building theories. He argues that all other explanations for variation in nation-building policies “cannot account for the variation in nation-building policies across space and over time without taking into account the international security environment” (187). This claim applies to domestic factors (e.g., race, religion, language, political ideologies, regime type, past interactions), structural international factors (non-core groups with a national homeland), and Michael Mann’s “dark side of democracy.” Either the explanatory variable is too slow to account for faster shifts in nation-building policies, or they cannot change at all. At the same time, these other factors are not trivial. Mylonas agrees that “ethnicity matters, but only when activated in the international arena” (188). Cultural distance may also be important, but more so in determining whether a policy will fail or succeed, rather than in the decision making process itself. Many of these factors play complementary roles, but Mylonas reserves the category of decisive variable to the interstate relations and the foreign policy goals of the host state. This academic investigation has policy implications. When countries consider supporting self-determination movements in other states, “the most judicious plan of action is to work with the borders we have, not the borders we want” (196). By encouraging such movements, host states are more likely to implement exclusionary measures. Also, “[a]s long as there are external powers that have an interest in destabilizing or partitioning other states…assimilationist and exclusionary policies will persist” (197). Third, regional integration fosters status quo foreign policies and encourages alliances, hence increasingly the likelihood of accommodation policies toward non-core groups. The theory offered in The Politics of Nation-Building has some clear limitations, which Mylonas recognizes. Any application must distinguish between intentions, policies, implementation, and outcomes. These four do not always align (if ever), due to the the nature of politics–principal-agent problems and “revealed preferences problem” where what is proclaimed may not be the actual preference of the political ruling elites. The application of the theory is also limited in scope to countries where there is a homogenizing imperative and enough data is available to tease out preferences of the ruling political elite. Mylonas relies heavily on archival data in some of his case studies, which is not an option for regimes that may actively destroy such evidence or block access to archives. There are two additional methodological difficulties that Mylonas does not address explicitly or at length in The Politics of Nation-Building. First, he does not satisfactorily defend the concept of a political ruling elite or elites. In the case studies, Mylonas focuses on usually one or two individuals who hold the top office in the country, but the messiness of domestic politics may at times stretch the category of policymaker. If there are several people jointly making decisions, what does a collective preference look like? Or if nation-building policies must be submitted to a law making body for approval, whose preference(s) is at play? This problem does not negate the usefulness of Mylonas’s theory, but merely begs for clarification of parameters and definitions. Second, Mylonas does not address the scenario where a non-core group is externally supported by both an ally and an enemy at the same time. When he analyzes the situation in China during the Cold War, external support of the Tibetans, Uyghurs, and Kazaks shifts cleanly from enemy to ally (refer to p. 179). USSR support for the Uyghur continued from when it was an ally (1949-1959) to its break with the People’s Republic of China (1960-1965). The same goes for the Kazaks. But the methodology gets ambiguous when he turns to the Tibetans. From 1949 to 1958, India is an ally or neutral and supports the Tibetans. From 1959 to 1965, the enemy supporting Tibetans is listed as the United States. It is odd that Mylonas uses the USSR as the external supporter for the Uyghurs and Kazaks for both time periods, as an ally then as an enemy, but has an odd disjunct between ally India and enemy USA when it comes to Tibetans. Why is India’s status as ally or neutral terminate in 1958 and seamlessly follow on to an American enemy. The break seems too clean when the Sino-American and Sino-Indian bilateral relationships at the time were not intercorrelated. This wrinkle in the data is not explained, but is not the primary methodological difficulty to be drawn. What if the United States supported the Uyghurs as an enemy of China, while India supported the Uyghurs as an ally of China? What would the result be? Mylonas does take into account the idea of asymmetry and the different levels of influence a weak and strong power may have. But both India and the United States are listed by Mylonas as “strong”. Again, this does not negate the instrumental role that Mylonas posits for interstate relations, but is a challenge that must be addressed. Like domestic politics, navigating these competing interstate relations can be turbulent and messy, creating conceptual difficulties. The book has been well-publicized through panel discussions at conferences and think tanks in the Beltway. The hypotheses contained in The Politics of Nation-Building will gain traction over time and become a position that future research must interact with, much in the same way as Mylonas has wrestled with other theories of status reversal, cultural distance, and the like. The clarity of Mylonas’s thinking makes the book accessible and his charity in taking conflicting theories seriously is commendable.